Combine the preserves, the water, the lime juice, the soy sauce, the mustard and the pepper flakes in a blender or food processor. Puree until all the ingredients are blended and the mixture is smooth. 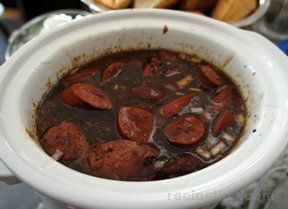 Pour sauce into a small bowl, cover and refrigerate until needed. (Sauce can be made 5 days in advance). Preheat oven to 350 degrees F. Line a large baking sheet, with sides, with parchment paper or a baking mat. 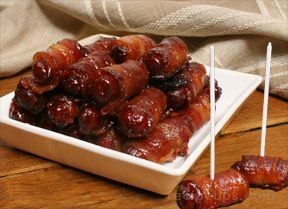 Wrap each sausage round with a slice of bacon, secure with a wooden pick, and set on prepared baking sheet. Bake until bacon is brown and crisp, about 20 - 25 minutes per side. 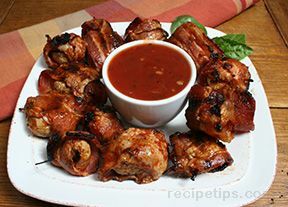 Remove baking sheet from oven, transfer bacon wrapped sausage coins to a paper towel lined plate to drain excess fat.